Nas on language, Cat Power on looking inward, Spike Jonze on loving what you do, and Kim Gordon on feeling the flow. These are just a few of the indie stars and surprising insights collected in this gorgeous book by Huck magazine. Since launching in 2006, Huck has been at the vanguard of London's thriving independent publishing scene and has grown into an internationally distributed bi-monthly, with editions available on newsstands in 20 countries worldwide. 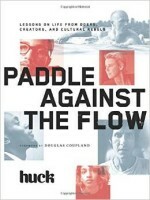 Bringing together the best insights from over 60 of the most inspiring people Huck has spoken to over the years—along with exclusive photography and art that has come to embody Huck's distinct aesthetic—this book presents a diverse range of truths, creative wisdom, and life lessons from those who paddle against the flow.